Sustainability is more than just a buzzword that is used by environmentalists. Everyone from consumers to architects and product manufacturers to marketing firms is aware of the importance of using sustainable materials, reducing energy consumption, and lowering carbon emissions. Commercial construction and home renovations, product development and shipping – nearly every industry has felt the effects of the global drive to create a more efficient future for our planet. At the core of this movement, you will find aluminum industry solutions. The advantages of using aluminum in everything from automotive parts and components to household goods has become clear, and studies now show that the aluminum made in the United States is more sustainable today than it was just a few years ago. There are so many reasons to use aluminum to create the parts, products, and components you need for manufacturing. Aluminum is lightweight, yet strong; is 100 percent recyclable, yet extremely plentiful on our planet, and what’s more – even raw aluminum takes considerably less energy to produce than it used to thanks to technological advances. Another major advantage of choosing aluminum over steel and other common materials is that aluminum can be easily extruded into an unlimited number of shapes. Custom aluminum extrusion can reduce costs for manufacturing by eliminating additional steps for fabrication to increase profits and improve quality across the board. While aluminum is used in consumer goods, creating everything from beverage cans to aluminum foil, when extrusion is used to produce aluminum industry solutions, manufacturers gain even more advantages. After the extrusion process, secondary operations and finishing, such as painting or anodizing aluminum can be used to further strengthen or enhance the appeal of this versatile metal. Basic rod and bar aluminum are used for infrastructure construction, commercial and residential building, consumer goods, and industrial equipment, among other things. More complex designs, such as custom aluminum extrusion profiles or dies, can be used to create just about anything you could imagine. Energy-saving frames for doors and windows, automotive industry parts and components, heat sinks for a liquid to gas conversion for big holding tanks – the possibilities are endless. At Silver City Aluminum, our team of engineers and technicians will work with you every step of the way to help you maximize the potential and understand the advantages of using aluminum in your project. 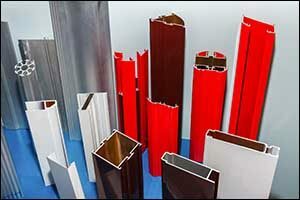 Whether you require telescoping profiles designed to fit perfectly within a product or to develop something entirely new and unique, you can lean on our knowledge of aluminum extrusion to achieve successful results. When considering the best material for your product development, consider the advantages of using aluminum when it comes to durability. Naturally corrosion resistant, aluminum has the unique ability to maintain structure and increase the lifespan of your finished product. It weighs just one-third the weight of steel, yet it is extremely strong. Its low weight makes it ideal for use in automotive production because parts can be lighter to increase fuel efficiency, yet remain strong due to the use of various alloys and strengthening operations during extrusion. When high-strength and durability are required, such as in the use of military vehicles of commercial construction materials, aluminum industry solutions are an excellent choice. Aluminum extrusion has been used in public transportation, construction of the world’s tallest buildings, and can even be found in shark cages to protect divers from attacks. Used to boost fuel economy yet maintain high strength, aluminum-based consumer vehicles have earned five-star safety ratings. Depending on the alloy and process that is used, aluminum can be engineered to be as strong as, and sometimes even stronger than, steel. Ready to Consider Aluminum Industry Solutions? If you are new to the idea of using aluminum extrusion for your industry, contact our team to discuss your options. Parts previously created through other processes and using other metals can frequently be improved due to the advantages of using aluminum extrusion. Whether you require basic rod and bar aluminum or needs something more sophisticated and custom in its design, our team can help you achieve your goals. Contact Silver City Aluminum by calling 508-824-8631 or use our online contact form to reach out to our team.